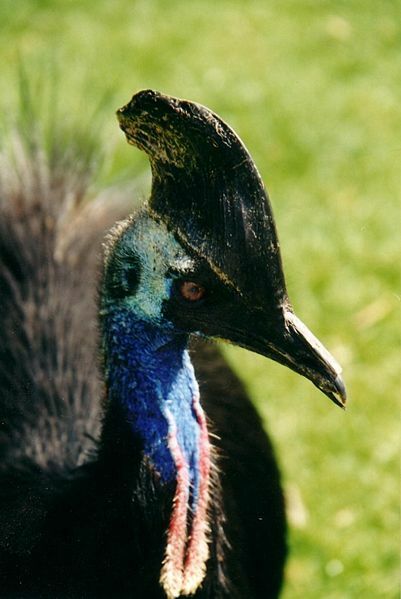 The southern cassowary is the world’s third largest bird. It is one of Australia’s largest land animals and plays a unique role in the ecology of the World Heritage listed rainforests of tropical Australia. They stand between 1.5-2 metres in height and both sexes are similar in appearance. Adults are striking with their glossy black plumage and bright blue neck with touches of red. The female is larger than the male and is also the more aggressive of the two. If you can see them that means you are too close and should take immediate protection. If you turn your back and run the bird will take that as a sign of weakness and will come after you at 50km ph (30 mph), which is faster than any human can run. The Guinness Book Of Records lists the Cassowary as the most dangerous bird in the world. In evolutionary terms, the flightless birds (or ratites) were some of the earliest types of birds to develop. The cassowary, emu, rhea, kiwi and ostrich are still around today, but others, like the moas of New Zealand and the elephant bird of Madagascar are now extinct. Cassowaries are very difficult to study because they lead solitary lives and live in dense tropical rainforest and remote and rugged terrain, so there is still much we don’t know about them. Until recently, the remaining wild population was thought to be at around 2000. However, new research by the CSIRO estimates that the cassowary population may be more than double that at around 4400. Queensland government data shows that this year alone at least 10 cassowaries have died because of human involvement. Six were struck by cars and four were killed by dogs. Rainforest vegetation has been extensively cleared, particularly in lowland areas. By 1997, 81% of native vegetation had been cleared, and remaining rainforest habitat was substantially fragmented. Roads are a major cause of direct cassowary mortality due to vehicle strikes. Roads can also fragment and degrade cassowary habitat; impose barriers on cassowary movement patterns; and hasten the spread of invasive species. Land is being cleared by property developers, the precious “Daintree rainforest is for sale on the open market with the guarantee of destruction from property development with DA approval already granted and council approved house plans included with the sale,” says the group. “Rare and endangered species such as southern cassowaries have been identified here”. Urban sprawl and coastal development along the aptly named Cassowary Coast now threatens the Cassowaries that have survived agricultural land-clearing. There have been in excess of 60 cassowaries killed by cars over the last 20 years in the Mission Beach area alone. Five recent reported deaths in three months attest to this. Cairns and the Far North have been tipped to become home to more than 500,000 people by 2050 – double today’s population. The region is the most populous in Northern Australia with 278,064 people and it is expected to more than double to 550,887 by 2050. Liz Gallie is the president of Mission Beach Cassowaries says “the cassowary is a keystone species of the rainforest,” and “the current planning scheme would allow Mission Beach’s population to reach 18,000, which is incompatible with the survival of the cassowary. Development is still seen by the local authorities and tourism organisations as the economic driver and is encouraged. It is an oxymoron”.